Technology has become a versatile term in the year 2018, encompassing hardware items such as computers and smartphones to innovative software systems we use on a daily basis such as social media apps and online investment systems. This has simplified our routine, but has also created new issues of computer eye strain for us to address called Computer Vision Syndrome. Since the 1990s, the progression of developing newer and more efficient devices became a continuing race of the decades to come. The early 2000s housed the transition between VHS tapes to DVDs and it’s projected to transition to fully immerse in a digital experience within the near future. By having to create various items to accompany the different technological trends, we’ve adapted to these various devices and simplifications to our lives. Communication is as easy as a touch of a button to call someone halfway across a continent within seconds. However, with the increased convenience and accessibility we have to digital products and innovation, how are our bodies keeping up with it? According to Diamond Vision, studies have shown that over a third of adults spend approximately 10-12 hours each day using an electronic device such as a computer or their personal device. Our eyes become tired from looking at a screen yet we still continue to use them one after another, straining our vision at the same time. 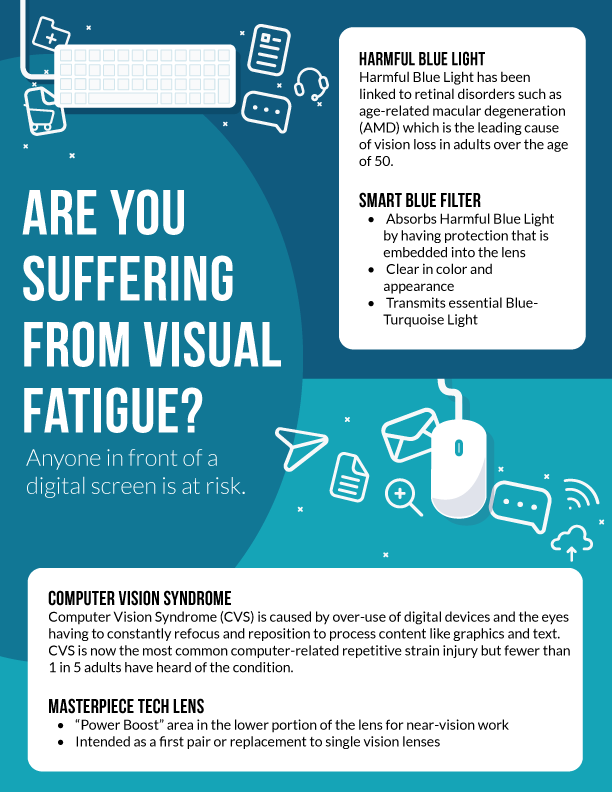 This causes various computer eye strain symptoms that can affect the way our eyes naturally function. A majority of Americans are also guilty of bringing their phones and other personal devices to bed with them. These devices use LED screens which emit a blue light that’s harmful to one’s retinas. Blue light, in comparison to UV light, can reach deeper into your eyes making it dangerous to stare at a screen for extended periods of time, especially in the dark. It can lead to age-related degeneration (AMD) and vision issues, possibly worsen your eyesight in the process. To help prevent CVS from further developing or worsening, it's important to take breaks from being on these electronic devices and monitoring your usage of it. Simple DIY treatments to help alleviate the symptoms include doing eye massages or making home remedies to soothe your eyes. Statista reports that in 2016, approximately 7.7 million people of the American population had a visual disability, such as myopia and/or astigmatism. This is defined as individuals who need some form of assistance with their vision to be able to see clearly. 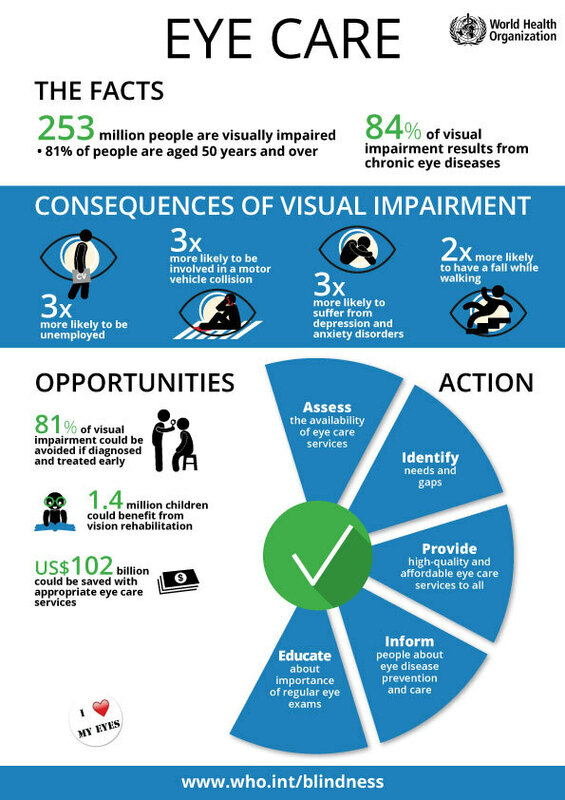 Approximately 3.8 million people with a visual disability were between the ages of 21 and 64, most likely due to the fact that this demographic makes up the working force in America. Adults aren’t the only ones being affected, as kids are becoming more involved with devices and other forms of technology at home and in the classroom. 706,400 Americans under the age of 20 require some type of vision correction, revealing how much these devices have become integrated into our daily lives. With technology becoming more easily accessible, preventing something as simple as limiting our usage of these devices turns out to be a lot harder than we thought. It’s important to try to be as mindful as possible about our time spent on these devices, check out our other tips to help combat Computer Vision Syndrome by clicking HERE.